Today I will try to shed some light on this game. It is also very interesting, since it is a game created by BioWare who, as you can read from my last article, aren't (or weren't - we will see) the best at creating a good RPG. Let's if they have learned something. 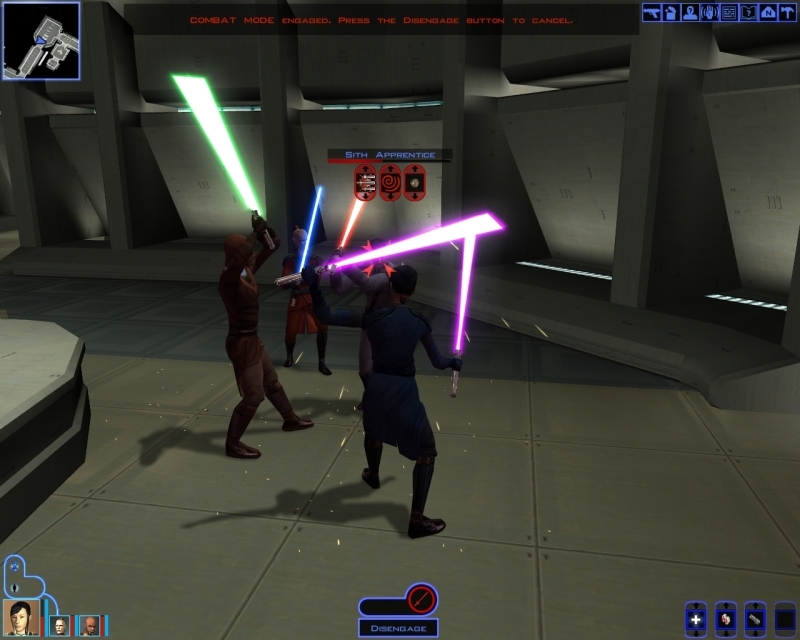 Knights of the old Republic (KOTOR for short) is an attempt to combine the Star Wars theme (a feature based theme) with a rule set (Dungeon and Dragons 3.0 rule set) that was made for ancient battles. But lets take a deeper look at the rules in the game play section of this article. Obviously BioWare has learned something from NWN and tried to get rid of their rather fixed point of view on telling stories. They tended to tell the player directly what to do and how to do it, instead of bringing the player into a situation and let him figure out how to escape it by exploring the area. At least in the first part the player awakes in such a situation. Surprisingly the art of storytelling changes later on, just to change back in the end section of the game. Excellent! The changes happen at the correct parts. For the overall story: You awake at a Galactic Republic ship, which is being attacked by the Sith. This takes place shortly after the Mandalorian-Wars (which occurred about 3000 years before the events of Episode I-VI), and after Darth Revan & Darth Malak (both Sith Lords) return. I won't either spoil the fun of telling the story, nor by extended this article into unknown dimension by telling the background story. Let me assure you, the Star Wars Expanded Universe background is deep in this, you can easily let yourself explain the story by asking one of the Jedi Masters. So this game definitely has earned plus points in the story. There is an amazing twist in the story which even surprised me. Me; who spends his time reading everything which can be read in the games (even those non-important books/datapads) and spends a lot of time listening to the NSCs. Look forward to this twist! Though there is one thing I would like to shed light on. If you haven't played the game yet, please don't read on. And be sure you have played and understood the story behind NWN original campaign set before venturing forth: I find the fact that you are seeking things created by an ancient race long forgotten (Star Maps by the Infinite Empire) pretty much copied from NWN, where the things are Words of Might created by the Ancients. To be frank, this lack of creativity saddens me. So a minus point on this one. What's canonical? Canonical and officially marked as correct by Lucas Arts is a male character and the light side ending. Just as a side information if you wish to stick the books/stories. 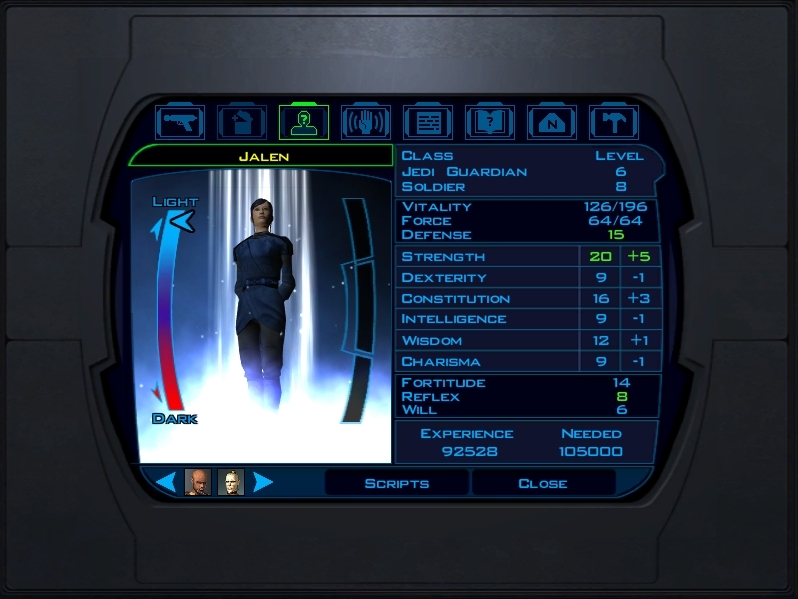 The gameplay is based on D20 role playing system. A system commonly used in RPGs based on Dungeon and Dragons rule set. You will find D&D rules 3.0 applied and well hidden. You won't find any dice rolls or overly confusing non-cumulative attack modifiers and such things. Everything plain and simple. A plus for the beginner, a minus for an experienced user. Therefore I will add this one neutral. First of all you will start by choosing your gender and a class. Three classes are available: A fighter, a scoundrel and a scout. I guess a fighter is self explanatory. A scoundrel survives by shooting blasters and sneaking around, whereas a scout survives by using special abilities just like repairing and or "hacking" (slicing) things. Each class can use their special abilities (fighting, slicing, sneaking, repairing) and feats (e.g. direct fighting feats, like a rapid shot) to get through the enemy lines. An example: Imagine a room full of enemy soldiers. A fighter would go in, and stand the fight by using shields and other items. A scoundrel would try to sneak through it unheard or overload a computer terminal in the room to kill every enemy. Instead a scout may overload the terminal too, or try to find and repair a broken battle droid to aid him in his battle. Apart from important fights such options are always given. This balances the classes and even leaves other ways to solve things, if it gets too tricky or too hard. For example: Even when you are a fighter, you might have some problems with certain enemies at some point. If this happens, you can still fall back to use a droid to aid you, for example. Excellent. There is an interesting alignment tracking system. Upon from good actions light side points are gained, and by doing crucial bad things bad side points are gained. If you choose to become a Jedi you gain additional powers apart from abilities and feats. So called force powers. You will recognize some of them from other Star Wars games, or from the movies, like: Force Push, Force Lightning or the Mind Trick ("These are not the droids you are looking for!" ;-). Being on the light side will make light side force powers stronger and they will cost less force points, and vice versa for dark side powers. You can also gather a small group of people around you, with a maximum of three (including you). They are fully equip- and upgradeable, and even have their own story, opinion and sub plots to solve. You may gain influence by acting the same way they would, or by standing by them when the are arguing with others. People who liked the NPC-dialogues in Baldurs Gate 2 will love it. Though I have to admit, that the lack of evil NPCs is disturbing. As far as I know there are only three, whereas there are five good ones. Speaking of the evil ones... HK-47 is a blow off. I have never seen a more comical NPC before. He almost beats Edwin (from the Baldurs Gate series) with his sarcasm and evil intentions. Hilarious! Though you can mostly safely "transit back" to a safe place, the game has a "game over". If one of your character goes down, he won't be dead. He will rise again badly hurt after the battle. But if all of your characters are down you have to reload. That's the way I like it. Even when settled in a future environment you will find archaic weapons, just like long swords and double bladed swords. Though it appears strange, it is explained that personal energy shields rendered the use blasters useless (this is just story - blasters can be really powerful in the game), thus the return to melee weapons. And remember: A light saber is also a melee weapon. Weapons and armor can be upgraded to make them even more powerful. The game also features some mini games: Pazaak, a Black-Jack alike card game, swoop racing (an arcade alike pod-racing) to earn some extra money and a battle simulation where you can shoot at some Sith Tier-Fighters with the ships very own laser turret (just speak with HK-47). You can also do them just for fun, of course. There are still some little drawbacks: Your inventory is a list and contains ALL items you ever bought or picked up. I am a lazy guy, who does not want to bother himself with selling items, therefore the inventory can get messy. I managed it in a game to own 24 different blaster pistols and 16 different light sabers. I guess you can get what I mean. Buying items itself is mostly useless - except for healing packs and shields - since the best items in the game can be found. And the thing with the datapads. Datapads are books that contain text. Mostly text relevant for quests. But how do I find the right one, when my inventory is filled with ten or more datapads all named "Datapad"? 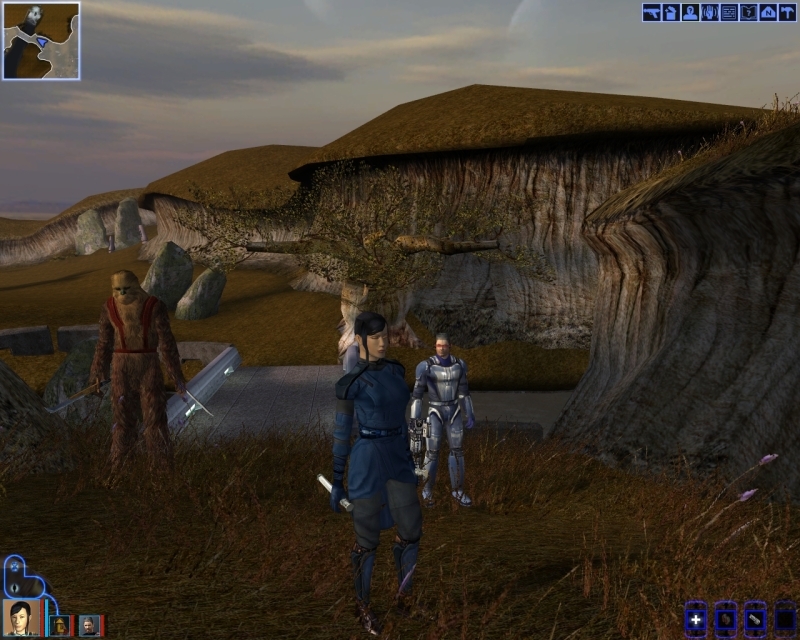 The game uses the successor of the Aurora Engine used in NWN and their expansions. It issues better graphics and a better overall visual appearance. The places look nice and the animations are well done. Textures won't get boring... except for the indoor ones maybe. The overall level design also got better, with different settings (under water, in space and so forth). Overall a good graphic set and you don't need a high end PC to play the game. Though the engine is unable to handle higher resolutions, just like mine of 1680x1050. Some movies shape the feeling. Especially the battle scenes are awesome. 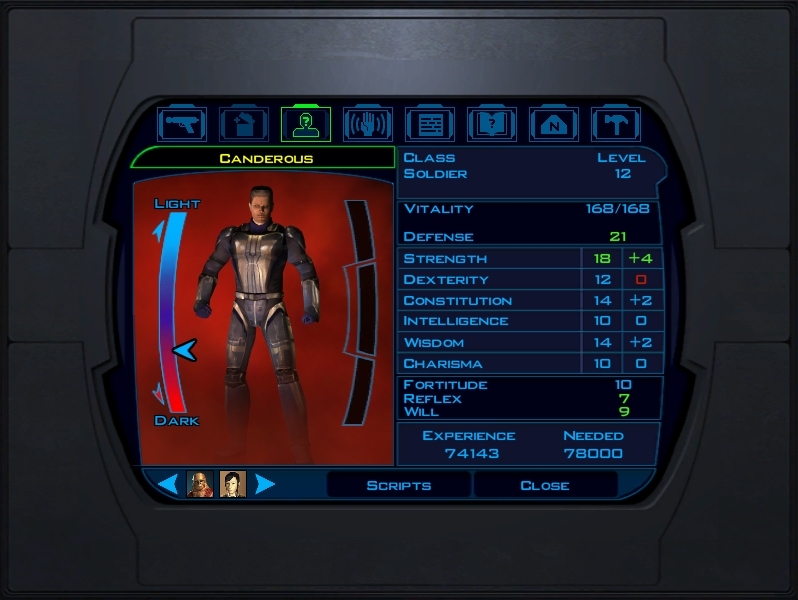 The sound features several soundtracks for different situations, like battles, or quiet places. Most of the dialogues are underlined with speech. The spoken sets are overly well done, at least in the English version. BioWare has learned from their mistakes from the past. Really, they did. 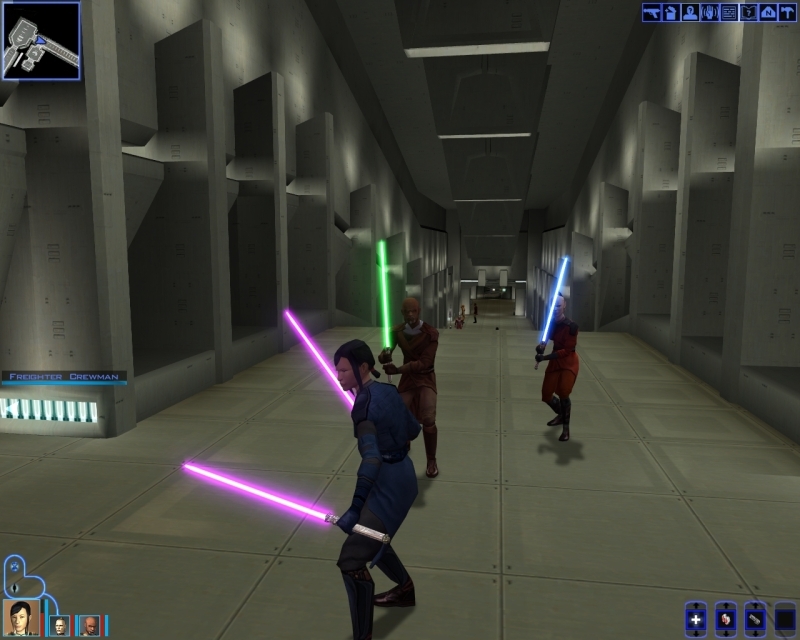 They have done a great job with KOTOR, and the game is really worth the price. And it is a must have for every Star Wars fan: *waving-my-hand* You will go and get it. > Official page with additional information. If you want to add your comment you must login or register first.